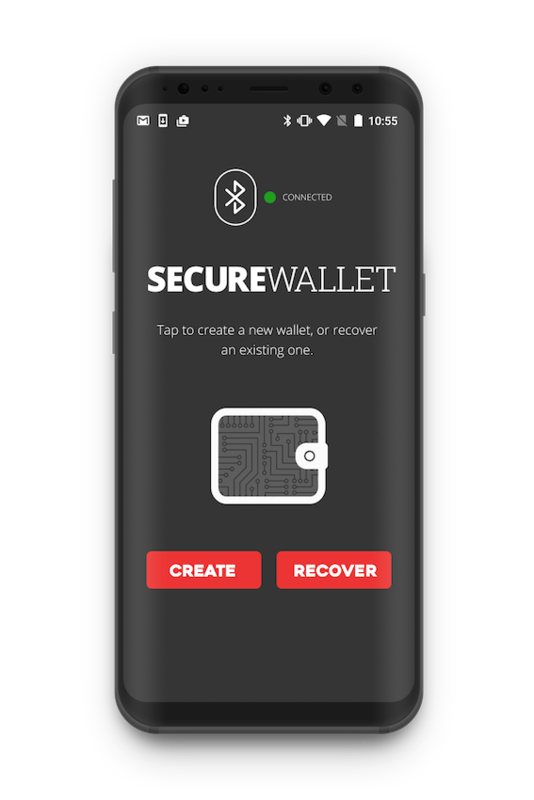 A combination of clever design, world-leading security, and a simplified user interface (the ECOMI app) have led to the worlds most secure, and portable cold storage wallet. However, we didn’t want to only bring to market the worlds best wallet, we wanted to make sure that we covered every aspect of your interactions with cold storage, to make the Secure Wallet the easiest to use, and the easiest to understand. With this in mind, we have also simplified the loss, backup, and restoration process so that you can rest easy knowing your crypto is safe, whether it is in your possession or not. When you first received your Secure Wallet, the packaging also came with a recovery booklet. This booklet is designed to help you record and protect your private key (seed phrase) in order to recover your balances. The private key is comprised of 12 different number combinations, which, when translated on the network point to a wallet address. We strongly recommend keeping your private key in a very safe place, and making copies of it if you are prone to losing things. In the event that you lose your phone or Secure Wallet, or need to update the firmware of the card itself (when new tokens are added) you will need this seed phrase. What Happens If I Lose My Secure Wallet? The first thing you need to understand is that losing your Secure Wallet doesn’t automatically grant the next person access to your crypto. And whilst they may be able to use the card itself, they will never have access to your accounts. The private key (seed phrase): generated within the hardware secure element and never leaves the device. When you initially set up your wallet, you are required to record this seed phrase (string of numbers) and re-enter them into the ECOMI app to confirm that you have recorded it correctly. This is also how you recover your balances/accounts in the event you lose your wallet, your phone, or both. Secure Bluetooth connection only allows approved devices to become a ‘host.’ You can register up to 3 devices, however, you cannot connect a new device without first retrieving a pairing password from the original phone. Hierarchical deterministic keys (HD keys): HD keys are a type of deterministic wallet, which uses the ‘seed’ to allow for the generation of child keys from a parent key. In the ECOMI app, you are able to generate up to 5 accounts (child keys) per token wallet, using HD keys. The relationship (chain of code) between the parent and child keys is invisible to anyone/anything without the original seed, and these are primarily used to simplify wallet backups. In this way, if you lose your Secure Wallet, you can regenerate the child keys using your parent key (seed), and regain access to your individual wallets and accounts. User interaction and confirmation. The Secure Wallet requires you to physically interact with it in order to sign and approve any transaction. That is to say, for any transaction to leave the device you must be in possession of the paired phone, the card itself, and have to confirm it by pressing the red button. Without this direct interaction, no assets can be released from the Secure Wallet. Pin code. The latest app version has also added a pin-code to open the ECOMI app. So assuming you already have a pin code on your phone, this adds yet another layer of security to your assets. As you can see, unless someone has access to your paired phone, the Secure Wallet card, as well as your phone pin code and the pin code for the ECOMI app, your crypto-assets are safe and sound. It is also important to note that at no time should you reveal your private key (seed phrase) to anyone! This is because anyone with access to your private key will also have access to your accounts. How Do I Restore My Balances? In the event that you do lose your Secure Wallet, we have made it as simple as possible to restore and recover your accounts. First, purchase a new Secure Wallet at our online store. Then, follow our quick set up guide to pair the new card with your smartphone. Note the process may vary slightly depending on whether you’re using Android or iOS. Once the new card is paired, you can recover your accounts simply hit the ‘Recover’ button. From here you will be prompted to enter your recovery seed, and once verified your original wallets will be set up and your balances restored! For more information about the Secure Wallet, or to replace yours, please visit our online store. If you love the Secure Wallet, and would like to become an ECOMI affiliate, please see this link. Get to Know the Secure Wallet: Loss, Backup and Restoration was originally published in ECOMI on Medium, where people are continuing the conversation by highlighting and responding to this story.